I found an old photo in a fairly cheap old frame in a wonderful antique shop on Dominion Road today -- and it has helped solve a bit of a mystery for me. Anyway ... this photo I found today looks like the centre part of the old hotel. I found, as well, that Maurice Kelly's original Wade Hotel burned down in 1880, so this must be the rebuilt version. So, an answer to my question almost two years ago -- the centre of the hotel, still to be seen today, dates from the 1880s. 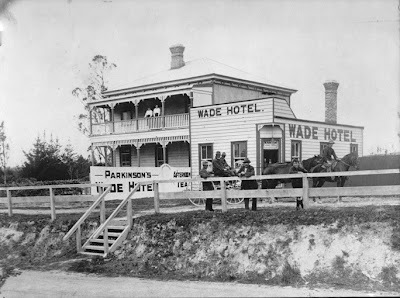 Think I prefer the original version of the Wade Hotel, much prettier. While Jayne has a somewhat unhealthy interest in chimneys and is perhaps more expert than myself, I note it seems to be the same chimney. Otherwise you would never know. Ho ho. She commented at the same time. That's another reason why I like you two -- you notice things like chimneys, like I do. Yeah, it looks the same to me, which pretty much clinched the deal. I tend to do that while walking along a street talking to people about buildings --"That building may look Art Deco on the outside, but its chimney gives away its age ..."
If you take a picture of the Wade Hotel today, you'll get another look entirely, an old employee of ours owns a share in it with his family and they have been working hard at updating it and we done all the fencing around the site. Thanks. If I took another photo today, though, it might get nabbed by whoever put the other image up on the View Auckland site without asking or giving due credit. That image is still up there, and no one has replied to my email to the site's owners. Bit of a shame, that. That's a business benefitting from a non-commercial blog. If you talk to the owners again sometime, could you ask them for a mention? Cheers.